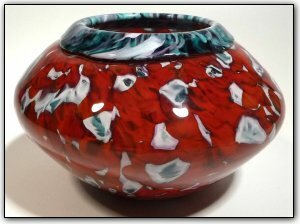 This absolutely stunning bowl features striking reds and luscious aquas, creating an intense and vivid piece of art. The outside features mostly reds while the inside features mostly aquas, with plenty of the inner and outer colors passing through to the other side. And everything comes together at the top, where the collar provides a perfect meeting point for the interior and exterior colors to come together.